The Spaland located 1-3F of the glass walled building. The backside tall bldg is the Shinsegae Department Store. Made a very short trip to Busan, the second biggest city in Korea. I stayed only 49 hours there, as a typhoon attack stopped ferries and shortened my trip, but I could visit three hot spring bath houses. Shinsagae Centum City Spaland is the newest and most recommendable. 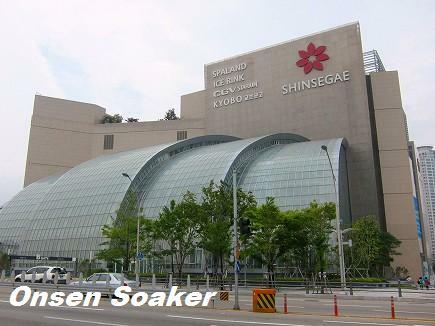 It annexed to the Shinsegae Department Store, just next to the Centum City Station of the subway line 2. Opened in March 2009, it's spotlessly clean with gorgeous atmosphere. The open-air baths are for ladies only. The big bath rooms are gender separated. They supply tow types of hot springs, one is Sodium chloride, and the other is Sodium bicarbonate. There are open-air baths for ladies only (Why not for men?). Their Jim Jil Bang or Sauna is worth visiting. There are many hot rooms and an ice room. All of them are gender mixed, you need to wear in house cloths, and you can enter any room you like. Some new bath houses in Japan are equipped with Jim Jil Bang, but its standard is far inferior to this spaland. Enjoy sauna hopping at their huge Jim Jil Bang. This is what we don't have in Japan. You don't have to carry cash inside. The IC-chip attached locker key records all in house expenses, and you pay the balance when you leave the spaland. There are big foot baths out side of Jim Jil Bang space. Why not take a nap after taking bath and Jim Jil Bang?